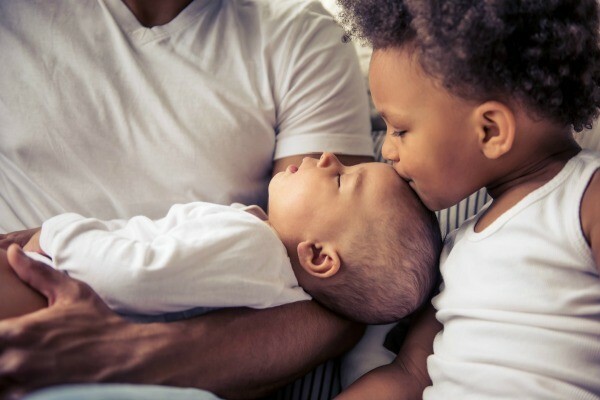 When expecting a new member in your family, it is important to make sure the older children know how important they are. This is a guide about preparing children for new sibling. Short-circuit sibling rivalry! When you know a new baby is coming into a home with an older child, make a personalized t-shirt for the older one(s) using plain t-shirts and fabric paint. I have 2 nieces expecting (#4 for each), so I will be making 6 t-shirts for the siblings. If the parents have decided on a name, you can say "so-and-so's BIG brother" (or sister), or "I'm the BIG sister!" (or brother), if you don't know the name. When the baby comes home from the hospital, each older sibling gets a present from the baby, a t-shirt to wear. Source: I've seen these in catalogs and refused to pay their prices. My husband and I will be welcoming our second child in October. Our son will be 23 months at that time. I've been a stay at home mom since he was born so he hasn't spent very much time without me. Does anyone have any tips on making this transition easier on him? I thought about putting together some goodie bags for him. Any tips or info would be great! My daughter was 26 months when my son was born. One thing I realized was that she would be self-conscious as to her acceptance or lack of acceptance, of the little one. So I tried nonerbally reinforcing her positive feedback to the situation. For instance, when she would come up close to me and the baby an show interest in the baby I would gently rub her shoulders or back and sometimes even give her a hug. This was not a verbal, "Good girl honey" telling her that her openess toward the baby and the baby and my relationship was good behavior. This was nonverbally telling her so, so that in a subconsious way she could feel good about the direction she was going. It took the pressure off of her and helped her accept the new situation in her own timing and measures. Sneaky, huh? It worked like a charm! Also, if you're breastfeeding, let the toddler sit on the arm of the chair or as close as he wants. It may be uncomfortable and cramped but can make him feel a part of it and cause you less grief in the long run. Here's what worked with my two kids. I have a 19 year old boy and a 16 year old girl that get along great. While I was pregnant, I let my son sit with me in my recliner. He would "talk" to the baby all the time calling it "sweetheart" and "angel". I told him how much me & the baby would need his help with feedings and changing diapers. If we happened to eat at McDonalds I would tell him how lucky he was to be a big boy because the baby couldn't eat french fries or how lucky he was to be big enough to play on the slide or play ball because the baby was too little to do those fun things. I took him to the doctor's office for one visit and let him listen to the baby's heartbeat. We even got a book showing what the baby looked like and how big it was month-by-month. It gave him a much clearer image of what was really happening inside mommy's "tummy". We also read (many times) the Bernstein Bears book about getting a sister. On the day we brought the baby home from the hospital, we gave my son a gift "from the baby". He was so proud of it, he'd tell everyone his little sister got it for him. Also, I encouraged anyone bringing baby gifts to bring my son a small gift. I kept small gifts (toy car, ball, etc.) in the closet just in case. I worked outside the home and I arranged different daycare situations for each child. My son was in a preschool setting which was wonderful for him and my daughter was with a woman in her home. It took a little extra time in the mornings, but it was worth it. Each child got exactly the attention they needed. A bonus was that since they hadn't spent all day together, they were loving to each other and played together very well in the evenings. It helped me when I was trying to cook dinner or clean house. I later became a stay-at-home mom and the brother/sister bond really made it alot easier. It's much more pleasant when you don't have to play referee to constant squabbles. Hope some of this helped. You'll get lots of parenting advice. Listen to it all and file it away. Because each kid is different and what worked with one child may not work with another. I heard several tips when I was pregnant that I immediately thought, "I'll never.....", "It'll never work...." well when my usual didn't work, I suddenly became alot more open minded. You just never know what will click with each child. I had my second child when my first was 20 months old. We got a nice gift and when we brought the baby home from the hospital, we got the gift out of the trunk and said it was from the baby who was so excited to have him for a big brother. I also had some very kind friends who brought small gifts for him when they came with gifts for the baby. They also visited with him first and then asked him to show them his sister. I really found no jealousy until the baby was old enough the be mobile - he seemed to see her as competition at that age since we were all so excited to see his little sister learning new things.